We have to start off by acknowledging James Shigeta’s role in the 1988 classic Die Hard, where he played the head of the Takagi Corporation. He took what should have been a throwaway role and through his quiet charisma made it forever memorable. You may not know his name but whenever someone says “You know, the CEO in Die Hard”, everyone knows who you’re talking about. What most people don’t know (I certainly didn’t) was that James Shigeta got his start as a singer in his native Hawaii in the 1950’s. He was discovered on the Ted Mack Amateur Hour and embarked on a tour of the nightclub circuit on the mainland. In 1950’s America being a handsome Asian singing star counted for diddley squat as far as Hollywood was concerned so Shigeta accepted an offer to star in musicals for Toho Studios in Japan. One problem: despite being of Japanese heritage he didn’t speak any Japanese. He learned enough to become a star for Toho and became known as “The Frank Sinatra of Japan”. We may have come far in our screen portrayals of minorities but how often do you seen an Asian man with a white woman on screen even today? It’s almost shocking to see it in these clips, given our assumptions about how minorities were treated in Hollywood back then. I have to mention a couple of personal ties both Scott and myself have to James Shigeta. A few years back Scott wrote a little action picture called Drive, directed by Steve Wang and starring Mark “Iron Chef” Dacascos. There was a small role for an evil executive for a Chinese corporation and everyone associated with the film was thrilled when James Shigeta accepted the role. He was only on screen for a few minutes, and much of that in a tiny video phone, but he took his role seriously and once again made a small role unforgettable. I had my own personal brush with greatness a few years later when I was shopping at the West Hollywood Gelson’s and realized the nice Asian gentleman in line ahead of me was James Shigeta. I was too star struck to say anything, I was just in awe of the man as he bought some fresh fruit. I can report that the cashier was quite taken with Mr. Shigeta, even in his 70’s he still had a way with the ladies. In an amazing 50+ year career James Shigeta had it all: a deep voice with a wonderfully smooth delivery, good looks, charm, charisma, acting ability. 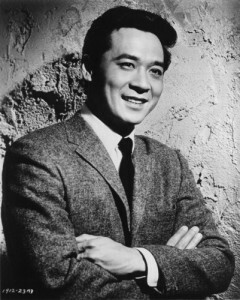 Perhaps he would have been a bigger star if he hadn’t been born Asian but regardless of his billing or the size of the role, James Shigeta was always an A List star.